Mukesh Ambani-led Reliance Jio is set to revolutionise the way internet services are consumed in India with the launch of its low-cost fiber broadband network, the JioFiber. The telecom operator created first waves of disruption with its free 4G services for a period of six months and later with introduced aggressively priced offers that forced the competitors to drops their tariffs too. With the launch of JioFiber, the disruption is likely to follow in the broadband sector. The JioFiber will introduce high-speed broadband services carrying data speeds up to 1 Gbps at minimal prices. However, the launch date of the service is still unknown, but reports suggest the service will go live by the end of this quarter. 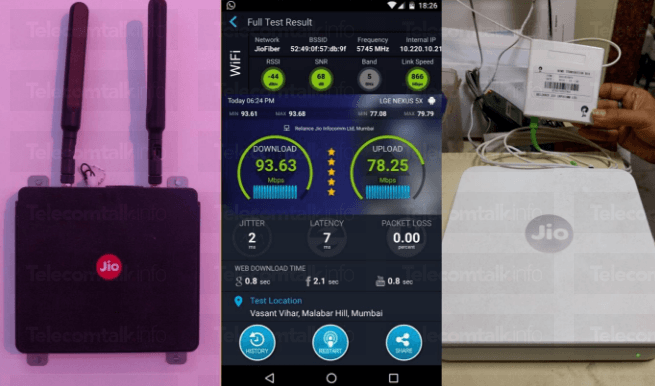 Jio is already testing their JioFiber service in about of 10 cities. The company continues to give fiber connections in select localities of cities like including Mumbai, Delhi-NCR, Ahmedabad, Jamnagar, Surat and Vadodara. And in Hyderabad too, there were several citizens reporting Jio’s team approaching them for a possible connection take up in their society. Under JioFiber Preview Offer, users now enjoying 100GB of free data every month. Though initially, Jio promised only three months of free broadband services, the chances are that much like the mobile services, users will avail free services till Jio officially launches its fixed broadband services. Of course, Jio will do that to add more users on board. Later when the offer period ends, subscribers are expected to pay Rs 500 for 600GB data and for Rs 2000 per month for 1000GB data at 100Mbps speed. These plans were leaked earlier, and there’s no evidence to consider these as final plans. Interesting thing here is that fixed broadband prices are usually much lower than wireless data, a trend that prevailed before the mobile data rates headed south. This suggests that broadband services will go down further following the JioFiber launch. Other broadband service providers like Airtel Broadband, ACT Fiber, BSNL and MTNL, have all dropped rates too, offering ever more data at higher speed caps. In fact, internet service providers are offering long-term plans with six-month deposit or even an annual payment in an effort to lock-in customers. So more the competition, more the benefits for broadband users. In addition, Reliance Jio plans to offer both broadband and Internet TV connection via a single connection in a bid to promote additional Jio services. This means you don’t to pay for your landline, broadband and cable TV connection separately. You’ll have a fixed voice, media share, live and catch up TV, home automation, surveillance and gaming services bundled together. Additionally, users will get to use the company’s entire content portfolio, which is the reason why telcos are ramping up their content services. March 2018 has come and gone. No commercial launch. Jio does not have the skills to finish projects on time. or, will it be March 2020? Good bye BSNL. Now u can use your ages old copper for scrapping. Already the poor copper lines outlived their life. Its time to take rest..